Ever wonder who manages Project OspreyWatch? Meet your fearless leaders. Bryan fitting a transmitter on an osprey. Bryan is the Director at CCB. 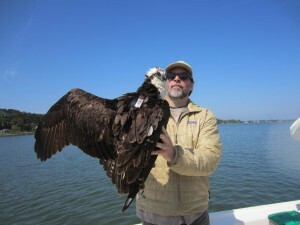 He has conducted many research projects on ospreys looking at diet, sibling aggression, food availability in different salinity waters, migration, and nest distribution. 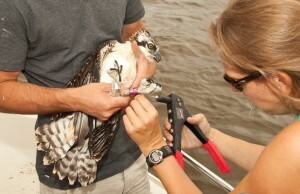 Below are a few articles from Bryan’s recent osprey research. He can be reached at bdwatt@wm.edu. Barb manages our email and Facebook page and promotes the project to the public. She also recruits new monitoring groups into the OspreyWatch program. She can be reached through osprey@osprey-watch.org. Marie manages the OspreyWatch data archive and website. She can be reached at mlpitts@wm.edu. Libby was a raptor biologist at The Center for Conservation Biology (CCB) in Williamsburg, VA from 2007-2015. 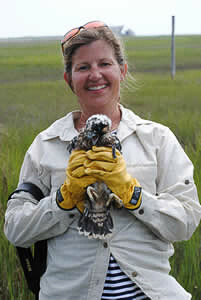 She managed the osprey research program and banded osprey throughout the Chesapeake Bay. Libby now serves as an adviser for the OspreyWatch project. Our talented programmers at Solertium crafted the code that maps your nests, logs observations, and archives photos in the OspreyWatch website. 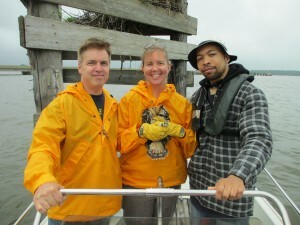 Read their blog post on an osprey banding trip where they connected their website application to live data collection.